Alice Pettigrew is a social scientist and senior research associate who leads the UCL Centre for Holocaust Education’s research team. She was one of the principal authors for both of the Centre’s national studies, Teaching About the Holocaust in England’s Secondary Schools (2009) and What Do Students Know About the Holocaust? (2016). Her primary research interests include: processes of identity formation; the intersections of ‘ethnicity’, ‘race’ and ‘nation’; multicultural and antiracist pedagogy; conceptions of interdependence, responsibility and remembrance; curriculum theory; ‘messy’ methodologies and qualitative research but since working for the CfHE she has led a number of varied, multi-method enquiries including large-scale, survey-based research. She currently serves as part of an advisory reference board for ‘Shifting Boundaries’: an empirical exploration of antisemitism in Norway funded by the Norwegian Research Council and has previously acted in an advisory capacity for the International Holocaust Remembrance Alliance (IHRA) Education Working Group. Alice completed a doctoral study, Complexity, Complicity and Community in the Classroom and Curriculum in 2007 and has since co-authored two education studies undergraduate textbooks, Learning in Contemporary Culture and Education Studies – A Reflective Reader as well as a number of book chapters, articles and conference papers related to the Centre for Holocaust Education’s research. 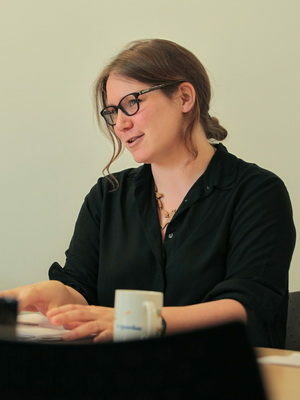 Alice currently supervises four doctoral students whose theses examine issues related to: teaching and learning about the Holocaust and other ‘difficult’, complex, contested or emotive histories, education and national identity formation, hate speech in the classroom and human rights education. Pettigrew, A. (2014) ‘Gender and Education’ in W. Curtis and S. Ward (eds) Education Studies: An Issue Based Approach. London: Sage. Pettigrew, A. (2012) ‘Confronting the limits of antiracist and multicultural education: “white” students’ reflections on identity and difference in a multiethnic secondary school’ Social Research Online 17 (3). Pettigrew, A. (2010) ‘Limited Lessons of the Holocaust? Critically considering the “anti-racist” and citizenship potential’ Teaching History 141. Pettigrew, A. and Foster, S. J. (2010) ‘Transforming teaching and learning about the Holocaust through research-informed professional development’ Professional Development Today 13. Curtis, W. and Pettigrew, A. (2010) Education Studies: Reflective Reader. Exeter: Learning Matters.